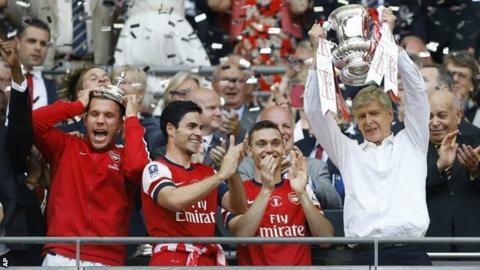 A possible move to rebrand the FA Cup as the Emirates FA Cup has been criticised by football figures. According to reports, a £30m three-year deal with the airline Emirates, which has a strong association with sport, has been agreed. Ex-sports minister and Football Foundation director Richard Caborn said it was "commercialisation gone mad". And Lou Macari, who won the trophy with Manchester United in 1977, said a name change "wouldn't sound right". A Football Association spokesman said: "We remain in discussion with a number of parties in relation to FA Cup partner opportunities." The competition has had several sponsors, but 'The FA Cup' written in its entirety has always remained. The Emirates proposal is expected to be discussed at an FA board meeting on Thursday. Caborn added: "You have the greatest name in football that has so many memories for so many people and you are just selling it off. "If it is about getting extra money for the grassroots, then I think the FA needs to go back to the drawing board and have another look at this." Former midfielder Macari also questioned the possible decision. "The one competition I thought would always be the 'FA Cup' and only the 'FA Cup', I can't really believe that's going to change," he said. "It is only changing for one reason, isn't it? The money."